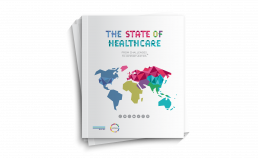 Sustainia created the “The State of Healthcare” report with DNV GL to look at the current state of global healthcare and points towards solutions, technologies, and people that inspire a new and brighter future. How can countries learn most effectively from other nations, with different cultures and approaches to healthcare? How can the challenges of one healthcare system be addressed most effectively? And how can citizens be empowered to take charge of their own healthcare improvements? These questions and more were addressed by DNV GL and Sustainia in a publication that showed how fundamental change is possible when people adopt systems approaches to risk management. We also brought through Sustainia’s risk to opportunity approach to highlight the solutions, technologies and people that are out there developing the future healthcare system. Roundtables discussions held in Brussels, Shanghai, and Washington D.C to inspire turning the insights of the publication into action. Collaboration and knowledge sharing within the EU and beyond holds great promise for addressing some of the similar challenges we are all facing. DNV GL is a global risk management and quality assurance company.